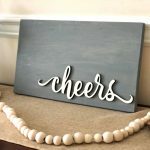 Football season is almost here — I’m looking forward to fun evenings hosting home-gating parties! It’s so much fun getting friends and family together. For me, the food is as important as the game! One dish I’m looking forward to preparing is a mini pretzel dog recipe with a pimento cheese dip. 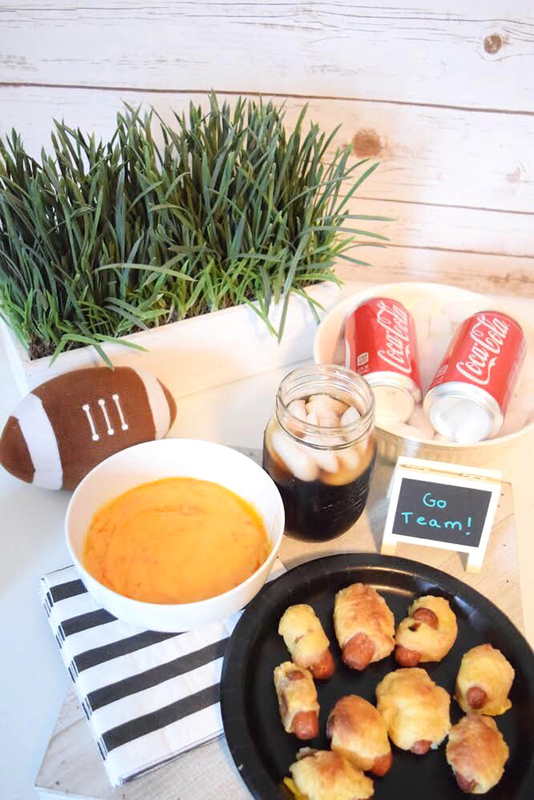 The pretzel dogs are amazing when dipped in the warm and flavorful cheese dip and served with icy glasses of Coca-Cola®! 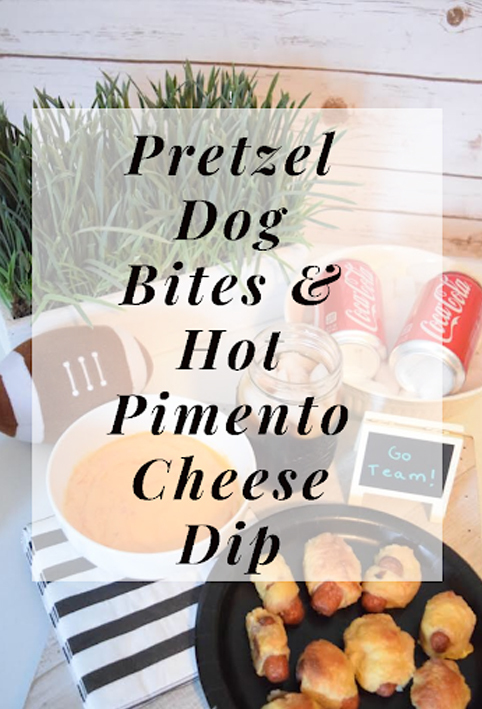 I treated my family to these pretzel hot dog bites and pimento cheese sauce with cold glasses of Coca-Cola® last week, and they loved it. 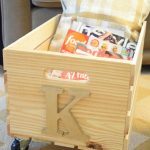 I enjoy hosting get-togethers with family and friends, but I don’t enjoy food shopping! I’ve discovered that using Walmart’s online grocery pickup can make getting everything I need for hosting a party so much easier. I was able to order the supplies I needed for my mini pretzel dogs and pimento cheese dip by going to Walmart’s grocery site. 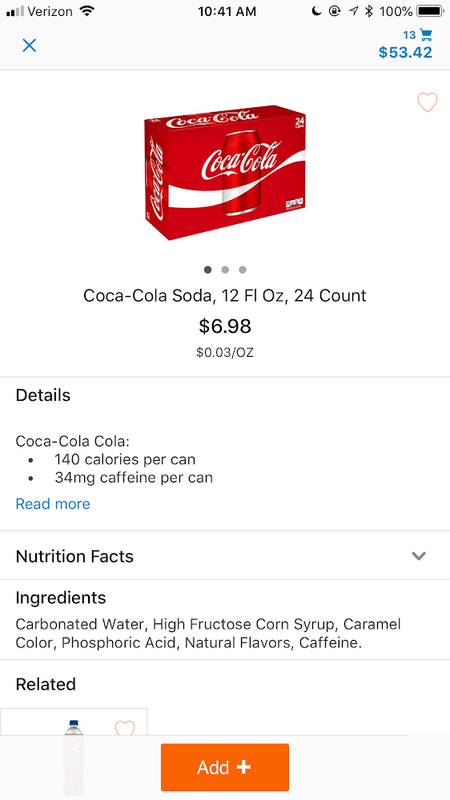 I also ordered a 24 pack of Coca-Cola®, which goes perfectly with the mini pretzel dogs and pimento cheese dip. 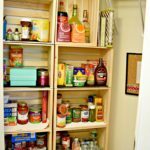 The best thing is that with online grocery pickup, Walmart brings the groceries right to the car! I love that. I usually buy my pretzel hot dog bites pre-made, but I wanted to make my own. 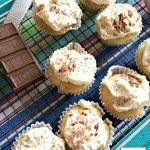 I found a recipe on The Noshery blog that looked easy enough. Her recipe, which I’ve used (below) is adapted from a Bobby Flay recipe for full-sized pretzels. Put the water, sugar, yeast and butter in the bowl of a stand mixer. Stir the ingredients with the dough hook until combined. Let the dough sit for 5 minutes. Add the salt and flour and mix on low speed until the dough is combined. Increase the speed to medium and continue kneading until the dough is smooth and the dough pulls away from the side of the bowl, about 3-4 minutes. (You can add flour, 1 tablespoon at a time, if the dough seems too wet.) Empty the dough out of the bowl. Put the dough on a flat surface and knead the dough into a ball. Oil the same bowl with vegetable oil. Return the dough to the oiled bowl. Turn the dough to coat it with the oil. With the dough still in the bowl, cover the bowl with a clean towel or plastic wrap. Place the bowl in a warm spot (I put mine on my kitchen table) for about 1 hour until the dough doubles in size. Use a butter knife to divide the dough into 8 equal pieces. Roll each piece into a long rope until just about ½ inch in diameter. Take a cocktail sausage and roll the dough around it. Pinch the seams of the dough wrapped around each hot dog to secure it. . Boil about 10 hot dog pretzel bites in the water solution at a time. Boil the pretzel hot dogs for about 30 seconds. Remove the hot dogs with a large slotted spoon. Place the hot dog pretzel bites, seam side down, on a baking sheet lined with parchment paper. There should be a small space around each hot dog bite. Brush the hot dog bites with the egg wash. Season with salt. Place the baking sheet in the oven and bake the hot dog pretzel bites for 15-18 minutes until golden brown. Turn the pan ½ way through cooking for even browning. After baking, remove the baking sheet to a baking rack and let rest 5 minutes before eating. 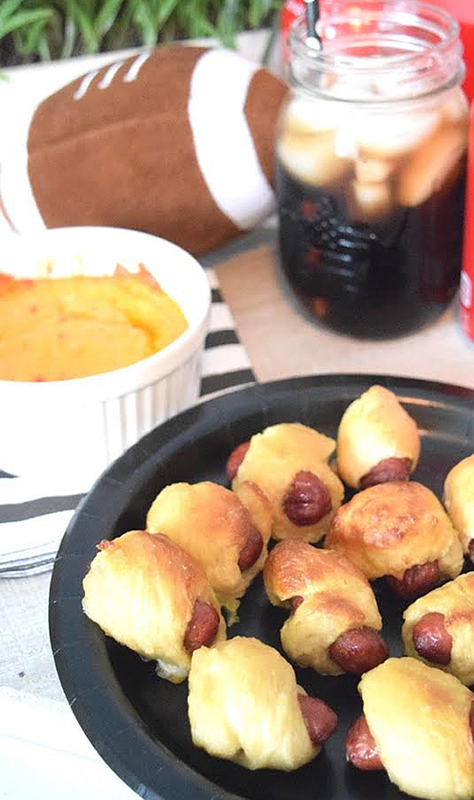 Serve the pretzel hot dog bites with cold glasses of Coca-Cola® and the pimento cheese sauce (for dipping). I discovered pimento cheese when I traveled to Charleston, S.C., last month. 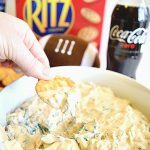 I had never tasted pimento cheese before, and loved it! So I set out for finding a recipe for this incredibly tasty, cheesy dip. I adapted a recipe that I found at the Mccallums Shamrock Patch blog. Take 4 ounces of cream cheese out of the refrigerator. Place the cream cheese in a medium-sized bowl and allow the cream cheese to soften at room temperature. Add the cheddar cheeses to the cream cheese. Drain the chopped pimento and place 1/2 of a cup or 4 ounces of the pimento in the bowl with the cheeses. Add mayonnaise, a dash (or two) of hot sauce, onion powder, red pepper flakes, salt and ground pepper to taste to the other ingredients in the bowl. Mix thoroughly. 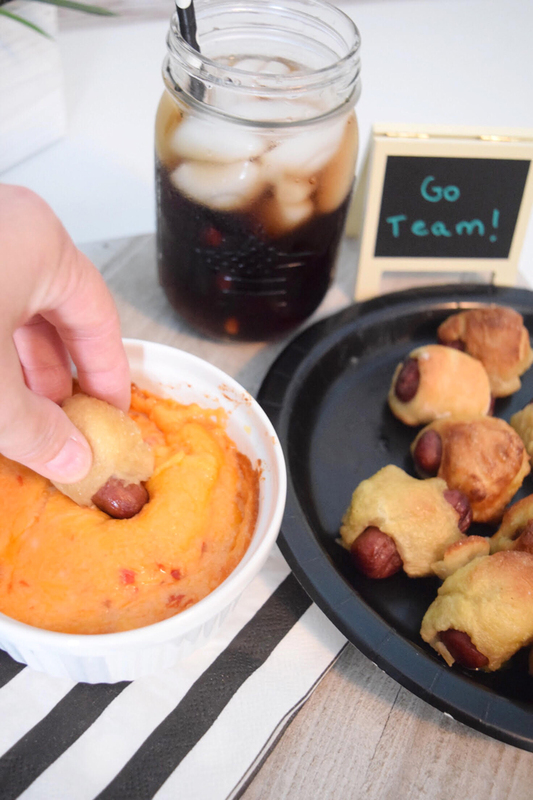 Serve with the pretzel dog bites for dipping. Walmart is a great one-stop place to stock up for all your tailgating and home-gating needs. 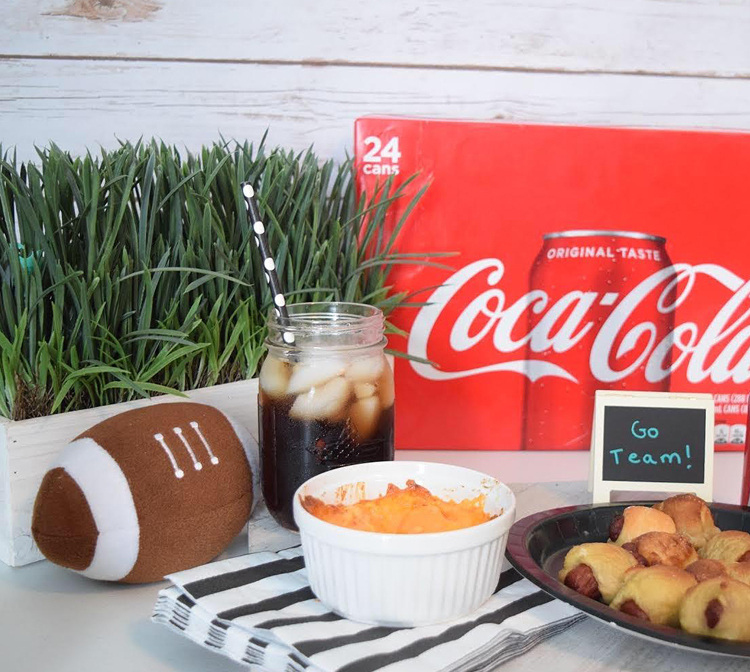 Check out Walmart for more fall tailgating and home-gating inspiration and recipes! 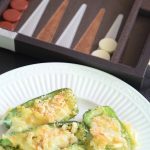 Pin this image below if you’d like to save this recipe to Pinterest for your next home-gating or tailgating party!